The B.A.T. 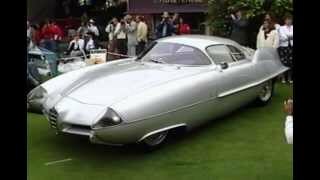 9 (Berlinetta Aerodinamica Tecnica) presented by Bertone at the 1955 Turin Motor Show was the third evolutional stage of Franco Scaglione’s project for bodywork with revolutionary aerodynamic shapes; however, it was less exasperated than those of the two B.A.Ts. of 1953 and 1954 and the side panels appeared more polished and homogenous while the tail fins were more collected. Developed on the Alfa Romeo 1900 Super Sprint mechanical components, the car showed an unmistakeable front end, marked at the centre by the typical Alfa Romeo shield. In 1955, the B.A.T. 9 was sold to Harry Woodnorth of Chicago, who sold it two years later to Ed Baseler of Lansing, Michigan, who then passed it to Arlen Regis. The vehicle was then sold to Gary Kaberle, who exhibited it at the beginning of 1987 at the Meadow Brook Hall Concours d’Elegance in Rochester, Michigan. In the 1950s, the clamorous generation of the three B.A.Ts. aroused extraordinary recognition for Nuccio Bertone with the public and international critics. He was invited to the 39th Pebble Beach Concours d’Elegance as guest of honour (18 August 1989) by David R. Brown – president of the Art Center College of Design, Pasadena, California. On this occasion, the three B.A.Ts. were exhibited together for the first time and, two years later, set out on a long itinerant tour, starting from the Autostory of Genoa in February 1992 and reaching Turin for the 80th anniversary of Carrozzeria Bertone. Other stages of this long commemorative journey were the Exposition Rétromobile in Paris in February 1993 and then the show organised by the Blackhawk Collection in May. The famous trio of automobiles was also the star once again at Pebble Beach in August and then, in 1994, at the Science Museum in London and the Auction and Sales Exhibition at Silverstone (30 July).